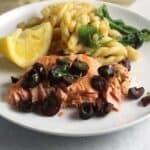 Salmon with Lemon Olive Relish recipe bursting with Mediterranean flavors. The recipe we provide makes a perfect date night meal for two, but can be easily doubled for more people. This salmon is perfect served with a Vermentino white wine. When I heard the Italian Food, Wine and Travel blogging group would be focused on Vermentino today, I searched my Cooking Chat archives for pairing ideas. 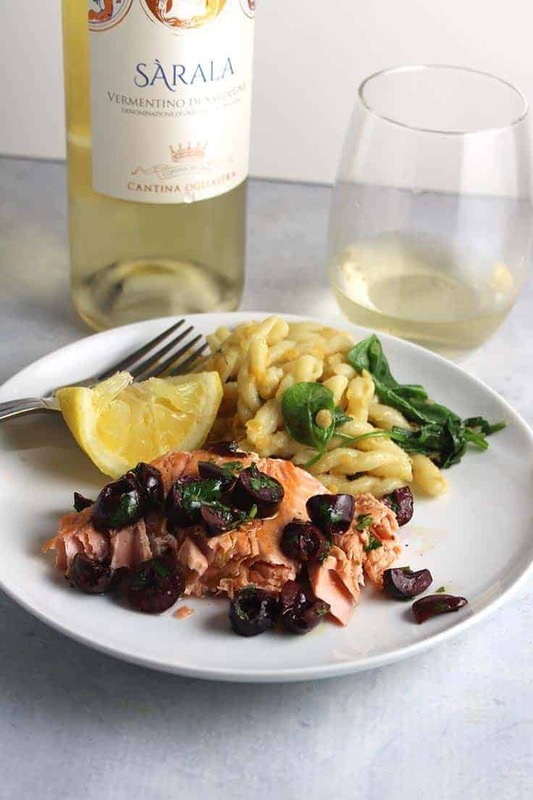 I decided to remake and share this Salmon with Lemon Olive Relish recipe, as a previous version paired well with a Vermentino. I can’t take full credit for the Salmon with Lemon Olive Relish recipe. I adapted today’s salmon dish from the cookbook Stir: Mixing It Up In The Italian Tradition , by Boston chef and restaurant owner Barbara Lynch. Barbara’s recipe taught me the basic approach I use for pan searing salmon, which serves as the basis for recipes like Simple Pan Seared Salmon with Ginger Soy Marinade. With this approach, you get a skillet good and hot, add a bit of oil, and then sear the salmon skin side down for four minutes without moving it. Then you flip it for a couple more minutes on the flesh side, and turn it back over to finish it. Under ten minutes cooking time and you have some salmon cooked just right! The pan searing makes the outside slightly caramelized and seals in the flavor and juice. My lemon olive relish is a bit easier to make then Chef Barbara’s recipe, as I simply squeeze some fresh lemon juice into a bowl along with the other ingredients. Her recipe has a process for segmenting the lemon and chopping it up. Tasty but definitely a bit time consuming. 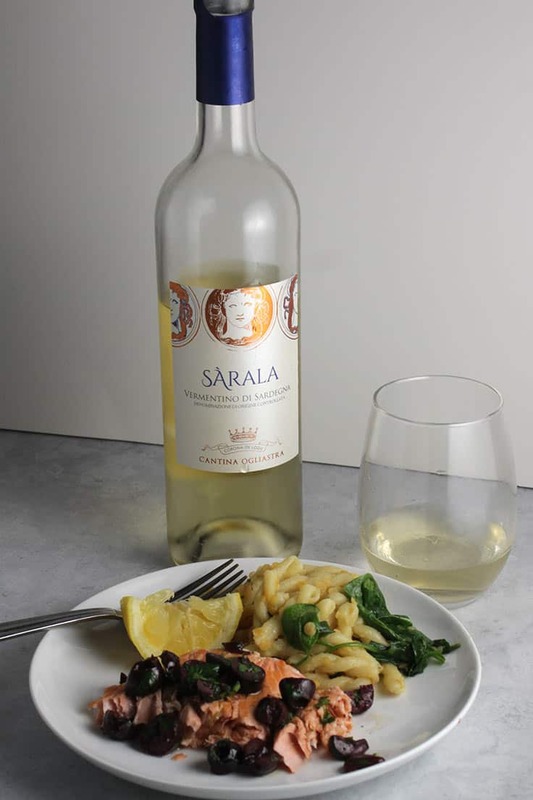 I opened the Sàrala Vermentino Di Sardegna ($18, 13% ABV) for this #ItalianFWT event. Floral nose, with lemon and melon fruit. Some minerality, with some almond notes. This Vermentino is more full bodied than many Italian white. The body helps make it a good match for the meaty salmon, and that lemon fruit of course goes well with the lemon olive relish. I definitely give the pairing an A! I also had a side of pasta with red lentils and ginger with the salmon, and that dish also paired well with the Vermentino. Sardinia is a great source for Vermentino wine. Lemons grow abundantly on the island, with the lemon trees giving fruit four times per year. Seafood is naturally common on Sardinia. 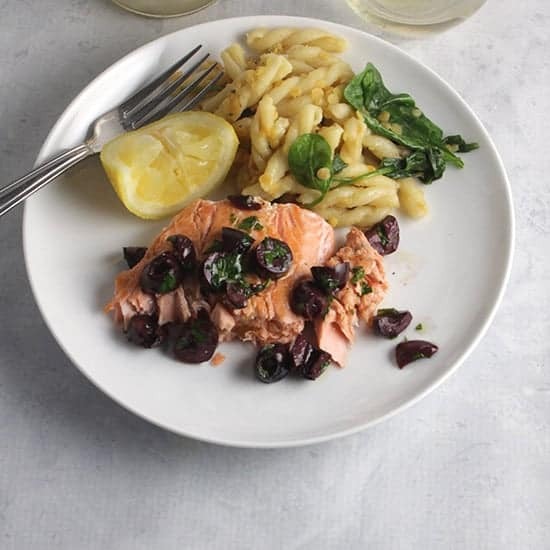 While salmon may not be the fish you are likely to eat there, I’d say our Salmon with Lemon Olive Relish served with a Vermentino definitely captures the spirit of the food you might eat in Sardinia. Are you not familiar with Vermentino? It’s worth getting to know! Vermentino is a white wine grape found primarily in Italy. Sardinia is certainly a prime spot for this white wine grape, but you can also find Vermentino in Tuscany, Liguria and other parts of Italy. In Southern France, the Vermentino grape is known as Rolle. This article on Wine Folly notes there are two different styles of Vermentino, one being rich and creamy and the other crisp and light. The Sàrala Vermentino is definitely on the richer side. 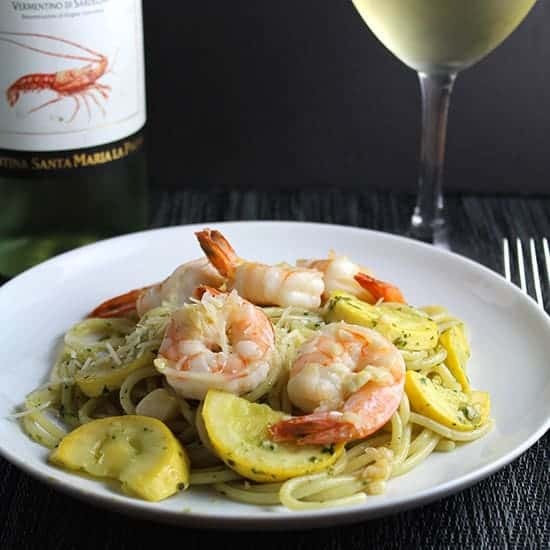 The Aragosta Vermentino that I served with this Spaghetti with Garlicky Shrimp shown above is a good example of the lighter, crisp style of Vermentino. Pan seared salmon topped with an easy and tasty lemon olive relish. Recipe serves two, making it a perfect date night meal. You can easily double the recipe for more people. Make the relish: combine all of the lemon olive relish ingredients–lemon juice, olive oil, olives, parsley, honey, vinegar– together in a small bowl. Add salt and pepper to taste, stir, and set aside. Heat the canola oil in a large nonstick skillet on medium heat. When the pan is good and hot, add the salmon skin side down in the pan. Cook the fish for 4 minutes without moving it. Use a spatula to carefully flip the salmon, to cook it flesh side down for 2 more minutes. Flip the salmon again to cook another 1 or 2 minutes, skin side down. The salmon should be ready for 8 minutes total cooking time, but cut open to check that it is done to your liking. Remove the salmon to a platter and let it rest briefly. Cut the salmon into serving portions, the top with a couple spoonfuls of the lemon olive relish. Pass extra relish at the table. Enjoy! Other white wine vinegar can be substituted for the Champagne vinegar. If the salmon skin sticks to pan when flipping, try to place the salmon back on a part of the pan without any of the skin. This doesn’t happen to often cooking the salmon as instructed. It is more likely to stick if you flip it to soon or move it during the initial 4 minutes of cooking. Join the rest of our Italian crew this Saturday May 5th live on Twitter at 11am ET #ItalianFWT and learn all about vermentino around Italy. Join in the fun! See you then for a taste of summer. Wendy from A Day In The Life on The Farm gives us “A Successful Search for Vermentino”. This is one dish I’m definitely going to make! Olives, lemons, and pan-seared fish? Yes please! Thanks for sharing another great recipe with us, David. Thanks Lauren! I hope you get a chance to try it. Just the sound of it makes me curious and feel like I’m on Le Med. Really lovely post as always – when does the Cooking Chat cookbook come out?!? Thanks Jill! I did actually do a little cookbook awhile back “Collards and Kale”. Perhaps it’s time to work on another! Thanks! That’s odd about the comment, will keep an eye out for other issues with that feature. MMM! The olives and lemon sound fantastic!